I have been wanting to make preserved lemons for ages since coming across them in salad, tagine, stew and dressing recipes. 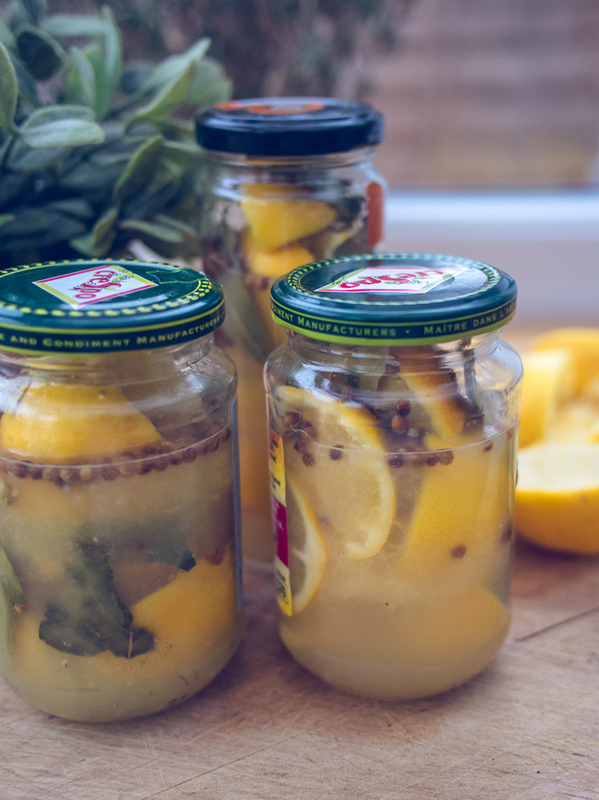 They are really easy and quick to make, make a great gift and the ingredients work out as about £1 per jar – you simply chop some lemons in to quarters, put them in a jar with some lemon juice, coriander seeds, bay leaves and lots of salt and leave them to preserve and marinate for at least 4 weeks. They are finely chopped and used lots in Moroccan and Mediterranean cooking to add a ‘mellow, sweet and salty undertone’ apparently. Once mine are ready I will try them out and report back here! You can use old jam/olive jars to store the lemons. Just wash them first then sterilise the jars and lids by placing them on a tray in an oven at 150 degrees/gas mark 2 for 10 minutes (or a dishwasher cycle will do the trick). Fill the jars while still warm (be careful as they will be very hot at first but don’t take long to cool down). This recipe makes about 4 jam jars worth (or 1-2 large jars). You should be able to find the coriander seeds and bay leaves in large supermarkets and international shops. Preserved lemons (makes 4 small jars) 20 lemons (8 for squeezing and 12 for cutting in to quarters) 4 tsp coriander seeds 12 bay leaves 100g salt Cut 12 of the lemons in to quarters and rub them with plenty of salt. Divide them in to 4 jam jars. Separately squeeze 8 lemons and add 100g salt. Give the mixture a vigorous stir and divide it between the jars (you want it to cover all of the lemons – I had to top mine up after the photo was taken). Add 1 tsp of coriander seeds and 3 bay leaves to each jar. Put the lids on and shake. Leave them for at least 4 weeks, turning often. They will keep for up to 12 months. When using, discard the flesh and chop the rind finely.